Seriously? I made two meals last weekend?! Why, yes I did. As I've previously stated, I rarely make meals on the weekends. Hello! When you have a Trader Joe's in your neighborhood, you can't feel guilty about frozen meals. Anyway, I decided to make a nice Sunday night dinner, and the hubs and I really enjoyed it. It was my first time trying a recipe from Elly Says Opa - I'm fascinated by her blog but feel intimidated at times. I'm so glad I picked this recipe. It's super easy and tastes fabulous. What's even better is that it used ingredients I already had on-hand - absolutely convenient! In a medium bowl, mix the honey, balsamic vinegar and garlic together. Add the chicken and rub in the marinade. Allow to marinate for about 20-30 minutes. Preheat the oven to 375. 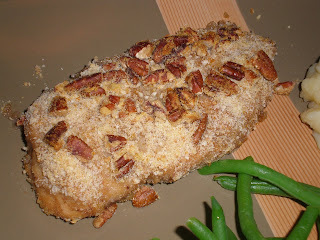 On a plate, combine the bread crumbs and pecans. Sprinkle the chicken with salt and pepper and then dredge in the breadcrumb/pecan mixture. Place a wire rack on a cooking sheet and spray with oil. Place the chicken on top and spray the top with a little cooking oil. Bake for about 25 minutes or until chicken is cooked through. *Note: I do not have a wire rack; the cooling racks I own have a rubber coating. I just placed the chicken in a glass baking dish. Unfortunately, the bottom was soggy (to be expected), but still yummy! If you follow her directions exactly, you'll have a crusty coating all over.